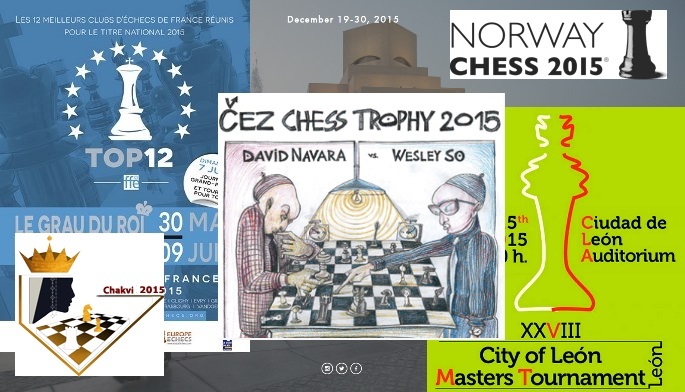 2015 features neither a World Championship match nor a Chess Olympiad, but chess fans have little to complain about. 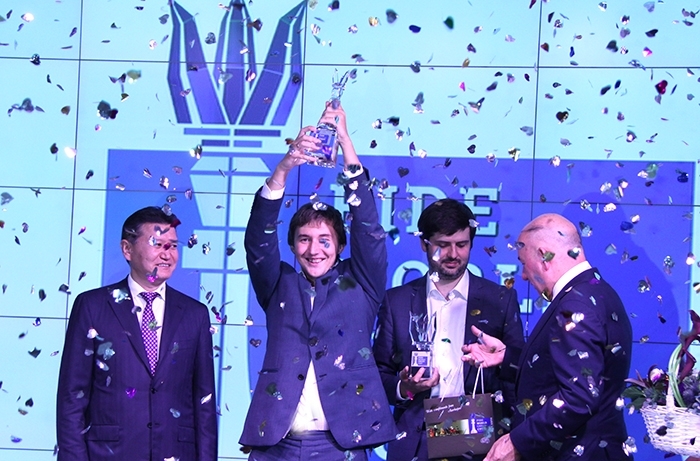 The calendar has never been more crowded, with long-established supertournaments like Dortmund, Tata Steel and Biel now joined by a host of star-studded newcomers that include Shamkir Chess, Norway Chess and the Sinquefield Cup. Add in a growing trend for strong opens (the Gibraltar and Qatar Masters) and official events that include the World Cup and the European Team Championship and it's hard to keep track of it all. That's where this regularly updated calendar comes in! We've now moved tournaments that are already complete to the end of this article, while you can find current or future events below. What is it? 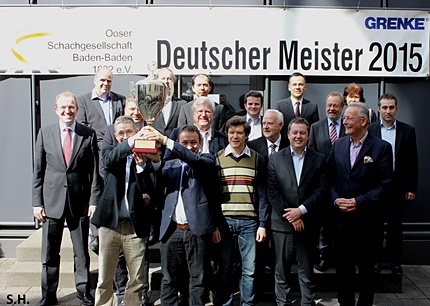 Two 9-round Swiss tournaments to determine the Men’s and Women’s European Team Chess Champions for 2015. Each federation can enter one male and female team of five players, with four playing in each match. What can you win? The prize fund is €20,000, with a €5,000 first prize in each category, but as in any big international sporting event the main prize is prestige. In the last event in 2013 it finished 1. Azerbaijan 2. France 3. Russia in the open event and 1. Ukraine 2. Russia 3. Poland in the women's event. Who's playing? All European Chess Federations are eligible to enter a men's and women's team. More info? Check out the official website. What is it? A 9-round 10-player supertournament that forms the third and final stage of the 2015 Grand Chess Tour. The main event is followed by the "Pro Business Cup" exhibition on December 14. What can you win? The prize fund is $300,000, with $75,000 for first place down to $15,000 for 7-10th. There's also an overall Grand Chess Tour prize fund, with $75,000 for first, $50,000 for 2nd and $25,000 for third. Who’s playing? The Grand Chess Tour regulars - Carlsen, Caruana, Nakamura, Topalov, Grischuk, Anand, Giri, Vachier-Lagrave and Aronian - are joined by local nominee Michael Adams. Where can you watch? The official website and chess24. What is it? The second edition of an open tournament that's managed to attract some of the world's best players. What can you win? The top prize in 2014 was $25,000. Who's playing? World Champion Magnus Carlsen has joined what was already an incredibly strong line-up, including Kramnik, So, Giri, Ivanchuk, Mamedyarov and Wei Yi. Where can you watch? We hope to broadcast the games live on chess24. These events have already taken place, and we've included a brief indication of the result and where to look for more information. What is it? The Tata Steel Masters and Challengers are two 14-player all-play-all events held over 13 rounds. More info? The Masters switches venue for Round 5 to the De Rotterdam building in Rotterdam, and for Round 10 to the Nieuwspoort Press Centre in The Hague. What is it? The main event is the Masters, a 10-round open that is yet again set to be one of the world’s biggest and strongest. What can you win? The total prize fund is £175,000 with a first prize of £20,000 as well as a £15,000 prize for the top woman. Who’s playing? Players on the Masters list include Hikaru Nakamura, Veselin Topalov, Peter Svidler and Women’s World Champion Hou Yifan. Where can I replay the games? At chess24 and the official website. What is it? The main event is a strong 9-round open tournament, though there are also women’s and students’ events. What can you win? The prize fund is 1,500,000 roubles (about $30,000 at current exchange rates) with 500,000 ($10,000) for first place. Who's playing? Ian Nepomniachtchi, Paco Vallejo and Igor Lysyj topped a field of almost 250 players for the top event. Where can I replay the games? On the official website and here on chess24. What is it? An 8-player all-play-all tournament featuring World Champion Magnus Carlsen and some of his biggest rivals. 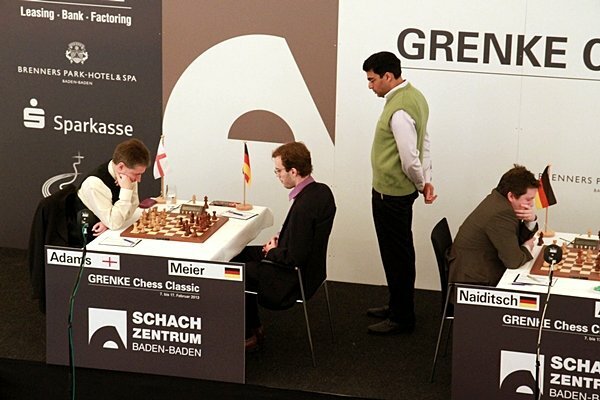 The inaugural GRENKE Chess Classic was a 6-player double round-robin in 2013 won by Vishy Anand ahead of Fabiano Caruana and Michael Adams, while in 2014 an 8-player German event was held as a qualifier. Who’s playing? 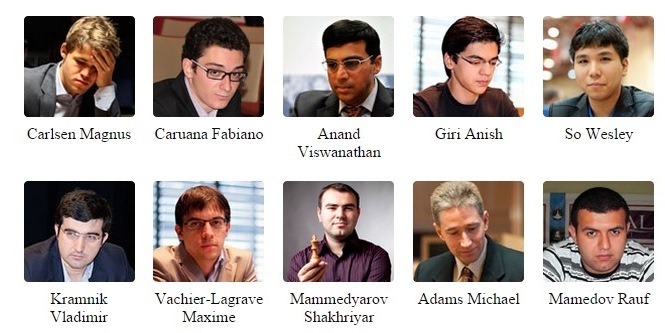 Magnus Carlsen, Fabiano Caruana, Viswanathan Anand, Levon Aronian, Michael Adams, Etienne Bacrot and 2014 qualifiers Arkadij Naiditsch and David Baramidze. What is it? As last year the players will play each other three times, once in blitz on the first day to determine who has which colour in the next section, then in classical games over five days, and then on a final day of rapid chess. Wins in the classical games are worth two points compared to one for rapid games. Who’s playing? Fabiano Caruana, Levon Aronian, Viswanathan Anand, Sergey Karjakin, Hikaru Nakamura and Vladimir Kramnik. What is it? The third of four stages of the 2014-15 Grand Prix series, a qualifying event for the 2016 Candidates Tournament that will decide Magnus Carlsen’s challenger in the 2016 World Championship match. The tournament is a 12-player, 11-round all-play-all event. What can you win? The top prize for the tournament is €20,000. Who's playing? Grischuk, Vachier-Lagrave, Giri, Dominguez, Mamedyarov, Jakovenko, Svidler, Andreikin, Radjabov, Kasimdzhanov, Tomashevsky and Jobava. More info? This tournament was originally supposed to be played in Tehran, Iran. The official website is here and you can also check out the overall Grand Prix website. Who won? Evgeny Tomashevsky finished on 8/11, an amazing 1.5 points clear of Dmitry Jakovenko in 2nd and 2 points clear of Teimour Radjabov in third. What is it? An 11-round Swiss tournament. What can you win? The prize fund is €120,000 with €16,000 for first place. The separate prize fund for senior players is €10,000, while €10,000 is also on offer for ACP members. The main attraction, however, is that there are 23 qualifying spots available for the 2015 World Cup. Who's playing? Nikita Vitiugov, David Navara, Pavel Eljanov, Ian Nepomniachtchi, Etienne Bacrot and Paco Vallejo were the 2700+ players in a field of 250. What is it? A big 10-round open tournament that was first held 50 years ago in 1964, when it was won by the legendary Mikhail Tal with a score of 12.5/13. What can you win? The top prize is €5,000. Who's playing? 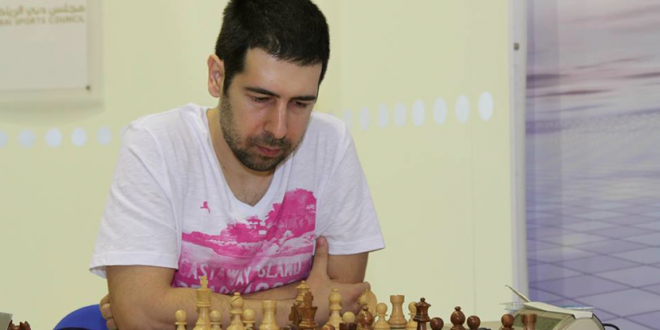 A field of over 250 players is topped by Shakhriyar Mamedyarov, David Navara and Pavel Eljanov. More info? 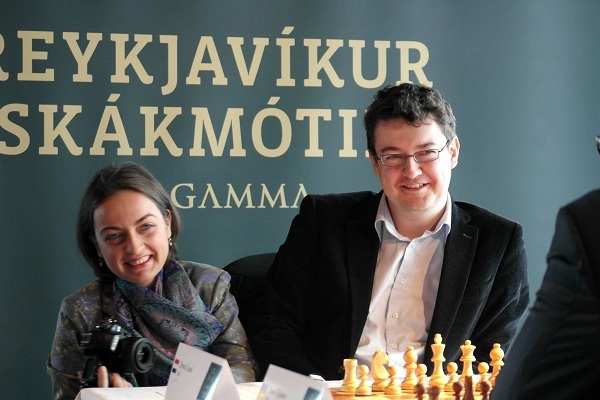 The tournament doubles as a celebration of the 80th birthday of legendary Icelandic Grandmaster and former FIDE president Fridrik Olafsson. What is it? A 64-player knockout tournament to determine the new World Champion. Each round consists of two-game matches (with rapid play-offs if required) before a four-game final. What can you win? The regulations specify a $450,000 prize fund with $60,000 for the World Champion. The winner also qualifies to play a 10-game World Championship match against the winner of the 2013-4 Women’s Grand Prix, Hou Yifan. Who's playing? The player list includes most of the top female players, though one very notable exception is reigning World Champion Hou Yifan, who will at least temporarily lose her title. Who won? Ukraine's Mariya Muzychuk defeated Russia's Natalia Pogonina in the final to become Women's World Champion. What is it? 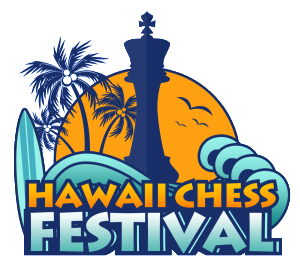 A new chess festival in Hawaii. The main events for top chess fans are a 6-round International Open, an International Blitz Open and a Grandmaster Challenge rapid event (6 rounds of blitz and 6 rounds of rapid) featuring Women’s World Champion Hou Yifan. What can you win? The International Open has a $25,000 prize fund with a top prize of $5,000, while the blitz is $2,000/$500. Who’s playing? The GM Challenge features GMs Hou Yifan, Sam Shankland, Timur Gareev and IM Shinya Kojima. The open events also include players such as GMs Niclas Huschenbeth and Alejandro Ramirez. More info? Hou Yifan had already agreed to play in this event before the Women’s World Championship knockout was scheduled for the same dates. Who won? 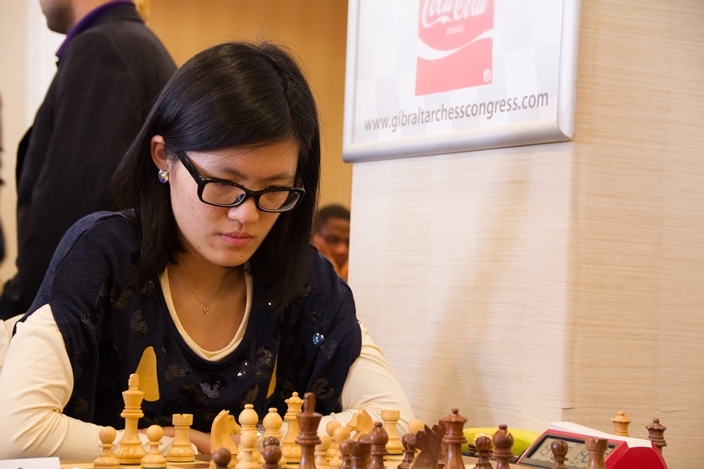 Hou Yifan scored 5.5/6 on the final day of the GM Challenge to win by a 2.5 point margin over 2nd placed Gareev. What is it? 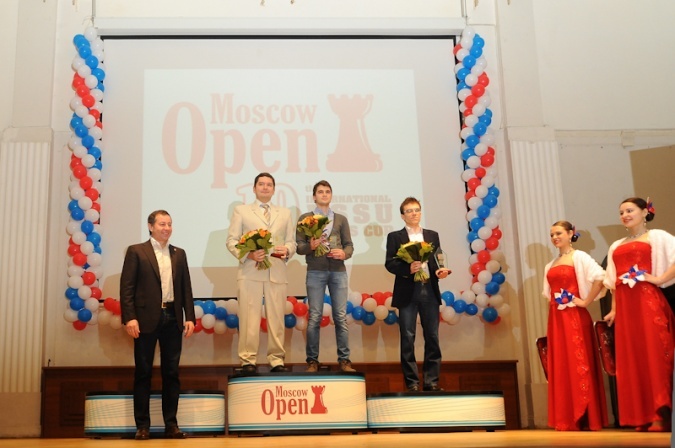 A big 9-round open that was last held as a classical chess event in 2012. There are three tournaments: A (players rated 2550+), B (2300-2549) and C (<2300). A 3 minute+2 second increment blitz tournament will be held on April 5th. What can you win? The total prize fund is €140,000. 1st prize in the A tournament is not only €18,000 but also a place in the traditional Dortmund Supertournament (June 27-July 5). 1st prize in the B tournament is €8,000 and €3,000 for the C event, with additional prizes for the best senior, woman and junior. 1st prize in the blitz event is €5,000. Who's playing? The list of participants is currently topped by Evgeny Tomashevsky, Richard Rapport and Paco Vallejo. Who won? Ian Nepomniachtchi tied with Daniil Dubov on 7/9 but finished first and qualified for Dortmund on the first tiebreaker of more games with the black pieces. Ivan Bukavshin was third. Nepomniachtchi also took clear first place in the blitz. What is it? Two 12-player, 11-round all-play-all tournaments to determine the 2015 US Women’s and Men’s Champions. What can you win? The total prize fund for the main event is $175,000, with $45,000 for 1st place and even $4,000 for the bottom-placed player. Who’s playing? Top 10 players Hikaru Nakamura and Wesley So play alongside reigning Champion Gata Kamsky, making this year's US Championship much stronger than it's been in recent years. Men: Kamsky, Nakamura, So, Robson, Onischuk, Naroditsky, Shankland, Akobian, Gareev, Troff, Holt, Sevian. Women: Krush, Sharevich, Abrahamyan, Nemcova, Paikidze, Melkhina, Goletiani, Ni, Wang, Virkud, Yu. More info? A $64,000 "Fischer Bonus" is on offer to anyone who can match Fischer’s 11/11 score in the 1963-4 US Championship. GMs Yasser Seirawan and Maurice Ashley and WGM Jennifer Shahade will again provide live commentary. What is it? The world’s top season-long team league competition (the Russian League is also extremely strong, but held over the course of a single week). 16 teams based in German cities play each other over 7 weekends, with each team represented by 8 players. Players come not only from Germany but all over the world. What can you win? As with any league the main prize is prestige and bragging rights, though teams at the bottom have to try and avoid relegation to lower leagues. For players the league provides welcome income that isn't dependent on results. Who’s playing? 128 players compete on each playing day, with top stars including Vishy Anand, Anish Giri, Levon Aronian, Maxime Vachier-Lagrave and Peter Svidler. Who won? Baden-Baden won their tenth title with a perfect 8-0 victory in the penultimate round. Overall they won 14 matches and drew 1 to finish 3 match points clear of second-placed Werder Bremen. What is it? A strong 9-round open with a field of over 160 players topped by English GM David Howell. What can you win? The prize fund is $50,000 with $12,000 and the Sheikh Rashid Bin Hamdan Al Maktoum Cup going to the winner. Who won? Dragan Solak took the cup, but prize money was shared among six players who finished tied on 7/9. The others were: David Howell, Vladimir Fedoseev, Ivan Ivanisevic, Eltaj Safarli and Andrei Istratescu. The tournament hit the headlines as Georgian GM Gaioz Nigalidze was thrown out for being caught cheating. What is it? A traditional 9-round open tournament that continues to attract a number of strong players… and chess24’s Jan Gustafsson. Who's playing? Wang Hao, Francisco Vallejo Pons, Nigel Short, Jan Gustafsson and Bartosz Socko top the current list of participants. Who won? After an amazing last round in which both Wang Hao and Paco Vallejo lost the winner was Nigel Short, who was tied on 7.5/9 by Surya Shekhar Ganguly and Kamil Dragun. See the full results. What is it? The second edition of a 10-player supertournament held in memory of Vugar Gashimov, an Azerbaijan chess player who died tragically young. What can you win? The prize fund is €100,000. Who won? Magnus Carlsen won his 3rd supertournament in 2015 with a brilliant 7/9 (5 wins, 4 draws). 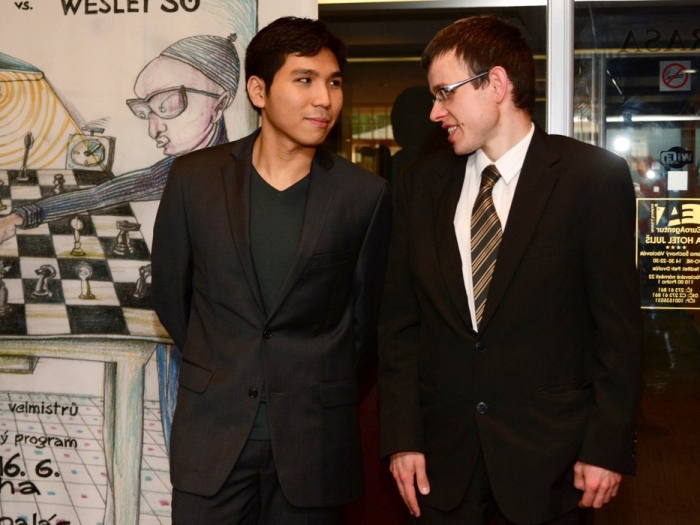 Vishy Anand was 2nd on 6/9 and Wesley So edged out Fabiano Caruana on 5/9. Read our final report. What is it? A 9-round 10-team event featuring national teams of 4 players plus 1 reserve, held every two years. Who's playing? Teams from Armenia, Russia, China, Hungary, India, USA, Egypt, Ukraine, Cuba and Israel, with star players involved including Aronian, Dominguez, Leko, Gelfand, Grischuk and Ivanchuk. More info? This year’s event overlaps with the supertournament in Shamkir, Azerbaijan, which means, for instance, that Vladimir Kramnik will not be representing reigning champions Russia. Who won? 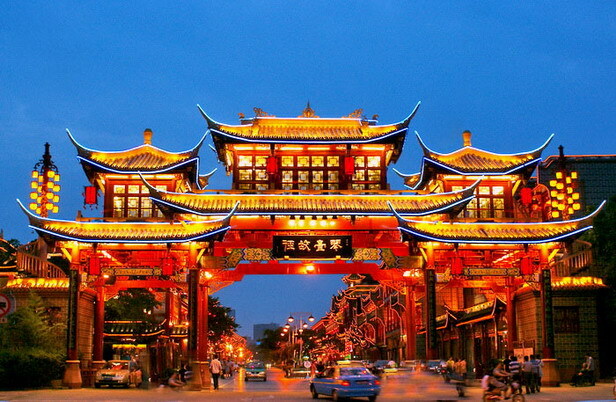 China followed up their 2014 Olympiad victory by winning another major team event. Ukraine were second and Armenia third. Read our report here. What is it? Held simultaneously with the open tournament but about as far apart as you could imagine, this is also a 9-round 10-team event featuring national teams of 4 players plus 1 reserve, held every two years. Who's playing? Teams from China, Poland, Georgia, Armenia, India, Russia, Egypt, Ukraine, Kazakhstan and China, with stars involved including new World Champion Mariya Muzychuk, Monika Socko, Bela Khotenashvili, Elina Danielian, Humpy Koneru, Valentina Gunina and Ju Wenjun. Who won? Georgia dominated by winning every one of their matches. The Russian women were second and China took bronze. Things could have gone better for Short! What is it? 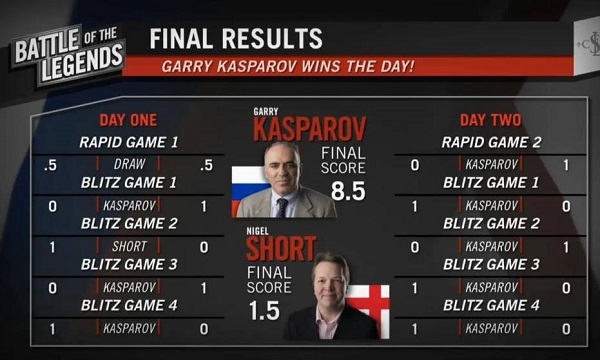 A 10-game exhibition match between Garry Kasparov and Nigel Short, featuring two days with one rapid game and four blitz games. More info? See our preview and the official announcement. Who won? Kasparov showed he hadn't lost his ferocious ability to attack by annihilating Short 8.5/1.5, winning all the games on the final day. Read our final report. What is it? A 7-round Swiss team tournament to determine the 2015 Italian Champions. The 47th Italian Masters Team Championship features 17 teams with four players taking part per team in each round. Who's playing? 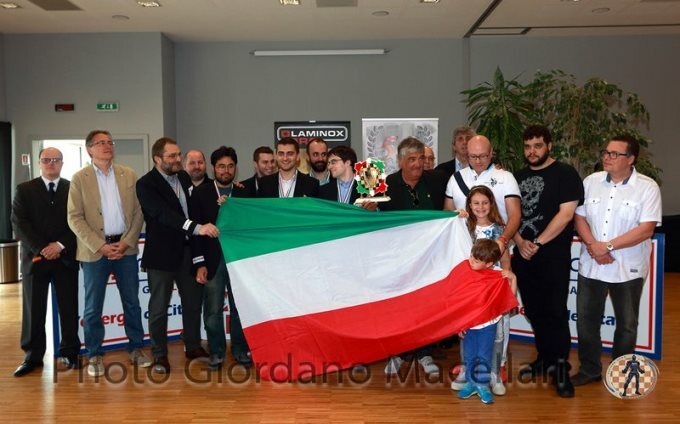 Hikaru Nakamura, Maxime Vachier-Lagrave and Etienne Bacrot all play for Obiettivo Risarcimento, the winners for five of the last six years. Who won? The favourites won on tiebreakers in the end after a big final round win for Hikaru Nakamura, though not without suffering some tough moments, including Maxime Vachier-Lagrave losing to a 2410-rated player. See also the full results. What is it? An extremely strong week-long team event for Russian-based clubs. As with the German League, some top foreign players also take part. This year there's not only a 7-round classical event (1-7 May) but also rapid chess (8-9 May) and blitz (10 May), with separate sections for women's teams. Who's playing? The preliminary 8 teams of 8 players listed at the Russian Chess Federation website include the likes of Peter Svidler, Leinier Dominguez, Radoslaw Wojtaszek, Baadur Jobava, Li Chao, Alexander Morozevich, Alexei Shirov and Gata Kamsky. Who won? Newcomers Siberia sprung a huge surprise on the eve of the event by including Vladimir Kramnik and Levon Aronian in their team. They went on to win all seven of their matches, with University (led by Radek Wojtaszek) second and Bronze Horseman (Peter Svidler) third. Last year's winners Malakhit didn't even manage to finish fourth and qualify for the European Club Cup. See our final report. What is it? A 9-round open with the top section limited to players rated above 2250 (or 2100 for women). Who's playing? Hou Yifan, Etienne Bacrot and Sergey Tiviakov are among the players already registered. What can you win? The overall prize fund is USD 40,000, with a 10,000 main prize in the top event. Where can you replay the games? On the official website and on chess24. What is it? An 8-player rapid (20 min + 5 sec) round-robin tournament with a difference - the games will all start from a position after three moves for both players that has been randomly selected based on recent grandmaster practice. The aim is to escape from the burden of deep home preparation. Who's playing? Eight of the best Spanish players including the top three: Paco Vallejo, Ivan Salgado and David Anton. Who won? Ivan Salgado was the surprise winner, finishing on 5.5/7, half a point above Paco Vallejo and David Anton. What is it? 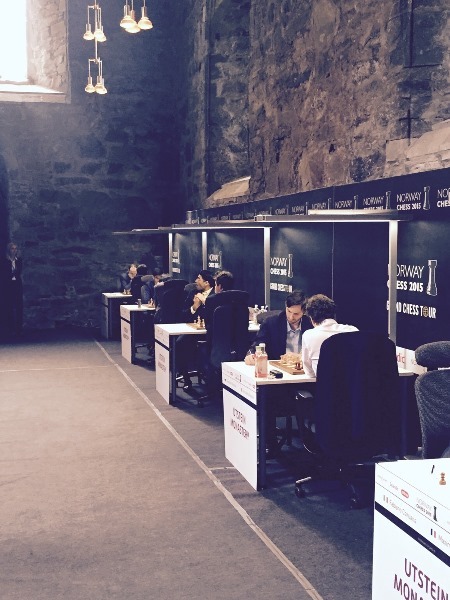 A qualification event for one spot in the 2015 Norway Chess supertournament. The format may be a double round-robin combining classical and rapid chess. Who's playing? Norway's Jon Ludvig Hammer, Simen Agdestein and Aryan Tari, Denmark's Curt Hansen, Sweden's Nils Grandelius and, something of a wild card, France's Laurent Fressinet. What can you win? Apart from the huge carrot of a place in Norway Chess the prize fund is a healthy€16,000, with €6,000 for the winner. More info? Magnus Carlsen will act as a commentator during the event. Where can I replay the games? Here on chess24. The event was covered in Norwegian by TV2 and on sjakkbloggen.no. Who won? It soon developed into a two-horse race which Jon Ludvig Hammer won after beating Laurent Fressinet from a lost position in their rapid game. What is it? The fourth and final stage of the 2014-15 Grand Prix series, a qualifying event for the 2016 Candidates Tournament that will decide Magnus Carlsen’s challenger in the 2016 World Championship match. The tournament is a 12-player, 11-round all-play-all event. Who's playing? Caruana, Grischuk, Nakamura, Karjakin, Vachier-Lagrave, Giri, Dominguez, Gelfand, Jakovenko, Svidler, Tomashevsky and Jobava. Where can I replay the games? Here on chess24. Who won? Caruana, Nakamura and Jakovenko tied for first place, with Caruana finishing first and Nakamura second in the overall Grand Prix standings. That meant they both qualified for the 2016 Candidates Tournament, though Jakovenko still has some chances of qualifying depending on other results in 2015. For more details check out our final report. What is it? The sixth edition of a big international blitz tournament featuring 21 rounds of action. Who's playing? 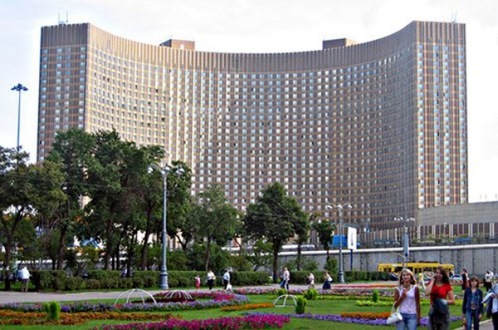 Shakhriyar Mamedyarov, Alexei Shirov, Loek van Wely and Erwin and Alina l'Ami are among the players already confirmed. Where can I replay the games? The official website and here on chess24 - we provided the tournament's official broadcast, including live video commentary by Nigel Short and Dirk Jan ten Geuzendam. Who won? Erwin l'Ami scored a supreme 18.5/21 to finish half a point ahead of Shakhriyar Mamedyarov. What is it? An 11-round Swiss tournament to determine the European Women's Chess Champion for 2015.
Who's playing? 98 players, including former Women's World Champions Antoaneta Stefanova and Anna Ushenina. What can you win? The prize fund is €60,000, with €11,000 for first place. 14 places in the 2016 Women's World Championship knockout are also up for grabs. Where can I replay the games? Here on chess24 and on the official website. Who won? Although suspicions of cheating overshadowed the tournament, Natalia Zhukova finished on 9.5/11, half a point clear of Nino Batsiashvili, who was a further point ahead of 3rd placed Alina Kashlinskaya. For full results see: Chess Results. What is it? 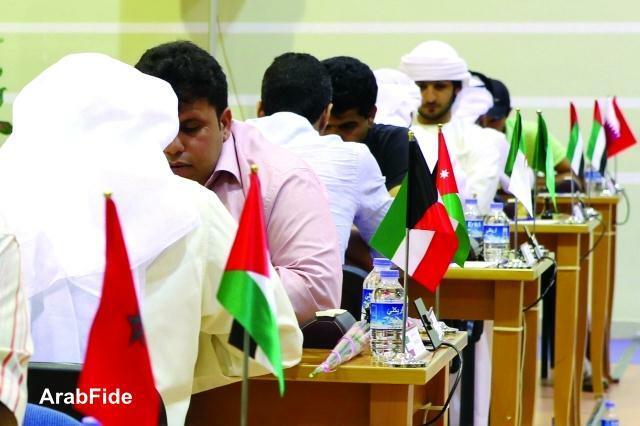 A biennial event where the top player from each of the 20 Arab FIDE federations is invited. The format is a 9-round Swiss Open. Who's playing? Grandmasters Bassem Amin (Egypt) and Salem Abdul-Rahman Saleh (UAE) are the favourites, but there are four grandmasters and 16 players in total, from 15 countries (only hosts UAE have a second player). What can you win? The prize fund is $20,000, with $8,000 and the Kirsan Ilyumzhinov Cup going to the winner. Where can I replay the games? Here on chess24 as well as on the Dubai Chess Club website. Who won? Qatar's Mohammed Al-Sayed pulled off a surprise win, finishing half a point ahead of Saleh and Amin. See the full results at Chess-Results. What is it? A top national team championship that ranks alongside the German and Russian leagues. The 12-team round-robin determines the top club side in France, with those finishing at the bottom of the table relegated to a lower league. Who's playing? 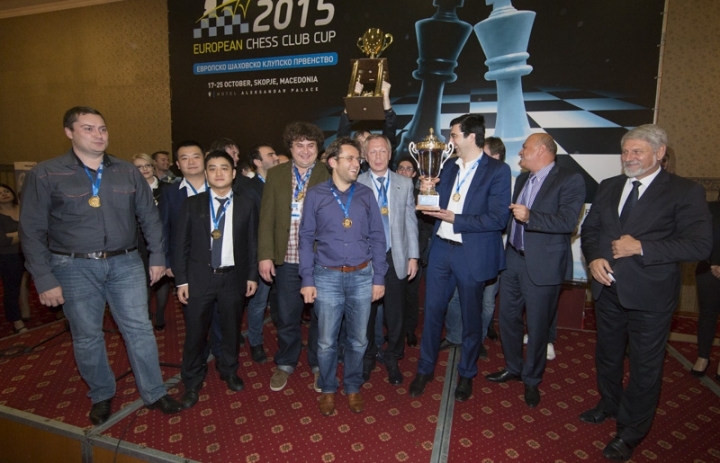 Clichy, the winners for the last three years, boast Wesley So, Maxime Vachier-Lagrave, Dmitry Jakovenko and Laurent Fressinet among their ranks, while Anish Giri, David Navara and Radek Wojtaszek are among the stars playing for other teams. Where can I replay the games? At chess24 and on the the official website. Who won? Anish Giri had the best performance of any player as his team Bischwiller won the event with a perfect 11 wins, including a 4.5:3.5 win over reigning champions Clichy. What is it? The main event is a 4-game classical match between David Navara and Wesley So. 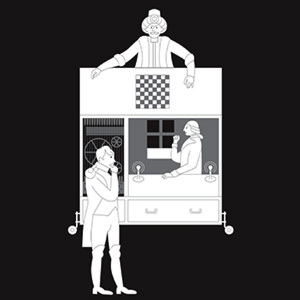 So will also play a simultaneous display on 12 June, while other events include the launch of a book by Navara entitled "Můj šachový svět" ("My Chess World"). More info? Check out the official website. Both players have reached their peak career ratings in 2015, standing at world no. 7 (So) and 14 in May 2015.
Who won? Wesley So won both his games with the white pieces for a 3:1 victory. What is it? A tournament with a long tradition that this year features four top players competing in two semifinals on Friday and Saturday to determine the finalists on Sunday. Each match consists of four rapid games at 20 minutes + 10 seconds per move, with blitz deciders played if required. Who's playing? 2014 winner and Chinese prodigy Wei Yi is joined by Maxime Vachier-Lagrave, Ruslan Ponomariov and 19-year-old Spanish rising star David Antón Guijarro. Where can I replay the games? The official website. Who won? 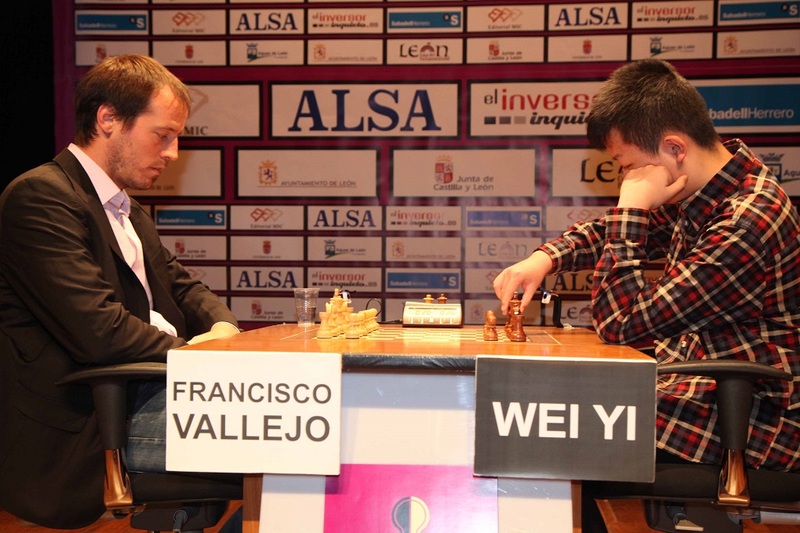 Wei Yi retained his title by beating Maxime Vachier-Lagrave in the final. What is it? The Elite tournament is a 6-player double round robin, while there’s also a 10-player Premium tournament and an open expected to feature over 150 players. Who's playing? Cuba’s Leinier Dominguez and Lazaro Bruzon will be joined by China's Yu Yangyi, Russia's Ian Nepomniachtchi and Dmitry Andreikin and Ukraine's Pavel Eljanov. Where can I replay the games? Here on chess24 or on the official website. Who won? China's Yu Yangyi finished a full 1.5 points ahead of Eljanov and Andreikin on 7/10 after winning four of his first five games. What is it? The third edition of a 9-round supertournament featuring the World Champion Magnus Carlsen and 9 more of the world’s best players. 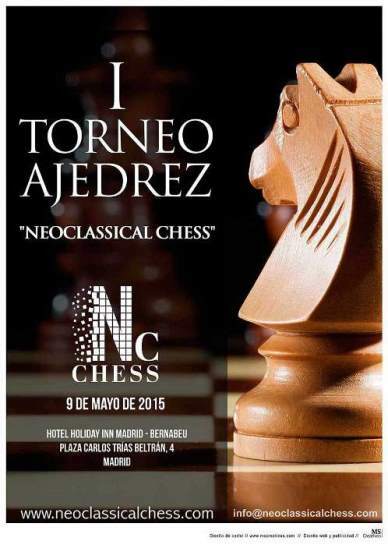 This year it will be the first event of the new Grand Chess Tour. What can you win? The prize fund is $300,000, with $75,000 for first place and $15,000 for 7-10th. 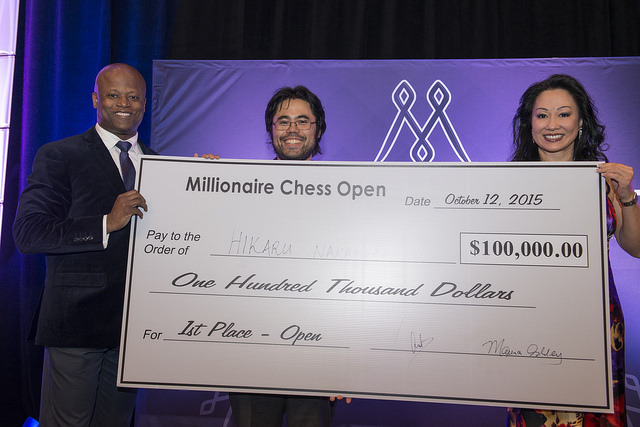 There's also an overall Grand Chess Tour prize fund, with $75,000 for first, $50,000 for 2nd and $25,000 for third. Who’s playing? The Grand Chess Tour players are: Carlsen, Caruana, Nakamura, Topalov, Grischuk, Anand, Giri, Vachier-Lagrave and Aronian. They will be joined by Jon Ludvig Hammer, who won the EnterCard qualifying tournament. More info? See the official website and the Grand Chess Tour website. Where can you replay the games? Here on chess24 and on the official website. Who won? Veselin Topalov finished on 6.5/9, half a point clear of Vishy Anand and Hikaru Nakamura. It was an extremely rare bad tournament for Magnus Carlsen, who lost on time to Topalov in the first game, then went on to lose to Anand, Caruana and finally Hammer. Check out our final report. What is it? A 10-player international round-robin tournament now being held for a 10th time. Who's playing? Last year's winner Vassily Ivanchuk returns, alongside other top players Pentala Harikrishna, Wang Hao, Sam Shankland, Surya Ganguly and five local talents. Where can you replay the games? At the official website and here on chess24. Who won? India's Pentala Harikrishna finished a full point clear of Wang Hao, Ganguly and Ivanchuk. What is it? An elite 8-player single round-robin tournament. Who's playing? 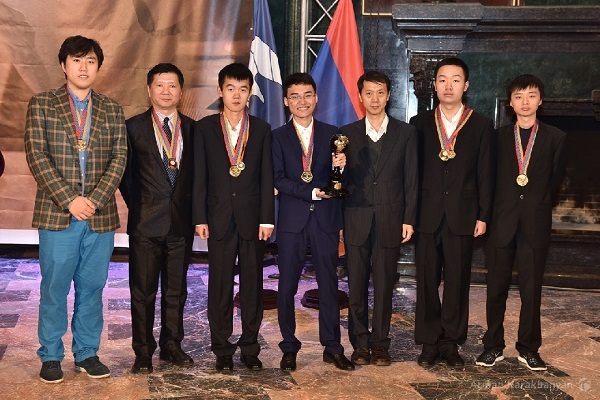 Vladimir Kramnik, Fabiano Caruana, Hou Yifan, Arkadij Naiditsch, Georg Meier, Liviu-Dieter Nisipeanu, Wesley So and Ian Nepomniachtchi. Who won? 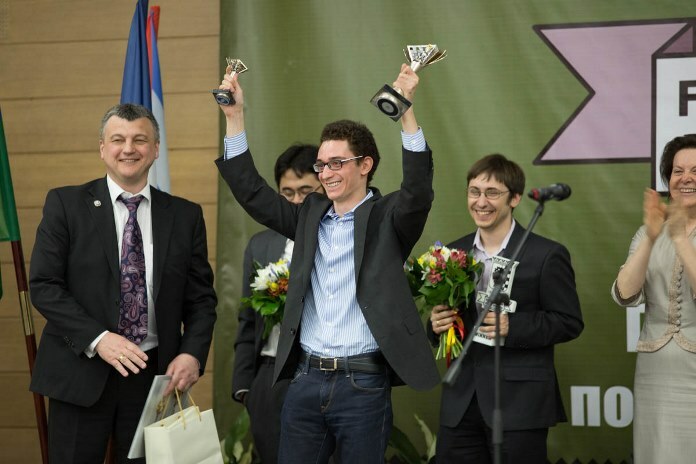 Fabiano Caruana won his last five games in a row to finish 1.5 points clear of Wesley So and Liviu-Dieter Nisipeanu. Check out our final report. What is it? The main event is a 6-player double round-robin accompanied by a number of other tournaments, including a strong open Master Tournament. Who's playing? Maxime Vachier-Lagrave, Michael Adams, David Navara, Radoslaw Wojtaszek, Pavel Eljanov and Richard Rapport. Who won? 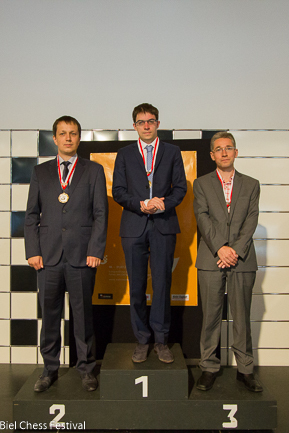 Maxime Vachier-Lagrave won a fourth Biel title and a third in a row after winning his last three games. Radek Wojtaszek finished second and Michael Adams third. Check out our final report. What is it? A 9-round 10-player supertournament that forms the second stage in the 2015 Grand Chess Tour. The main event is followed by another "Ultimate Moves" chess exhibition on September 2. Who’s playing? The Grand Chess Tour regulars - Carlsen, Caruana, Nakamura, Topalov, Grischuk, Anand, Giri, Vachier-Lagrave and Aronian - will be joined by wildcard Wesley So, to make this one of the strongest tournaments ever held. Where can replay the games? Here on chess24. Who won? 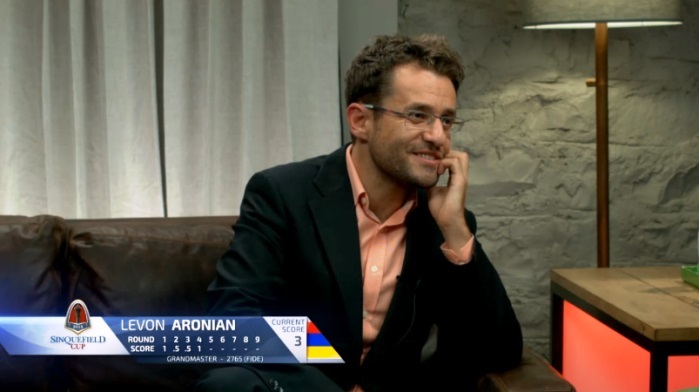 Levon Aronian returned to form to win the tournament with three wins and six draws, finishing a full point clear of four players, who included Magnus Carlsen. Despite enduring a tough event Magnus took second on tiebreaks, with the Grand Chess Tour wide open going into the final event in London. Check out our final report. What can you win? The prize fund is $1,600,000 with $120,000 going to the winner and even those who lose in the first round taking home $6,000. Who's playing? Apart from the absence of Magnus Carlsen and Vishy Anand it's a who's who of world chess, with Levon Aronian also playing despite the conflict between Armenia and Azerbaijan. Who won? Sergey Karjakin won 6:4 in a final where all ten games were decisive. Peter Svidler came incredibly close to claiming his second World Cup triumph but had to settle for joining Karjakin in the 2016 Candidates Tournament. Check out our final report. What is it? The main Masters event is a strong 9-round open. What can you win? The prize fund is £32,000 with a first prize of £10,000. There are also women's prizes totalling £7,000. Who's playing? Confirmed players include Michael Adams, Pentala Harikrishna, Arkadij Naiditsch and 2014 winner Nigel Short. Who won? A hard-fought last-round draw against Short allowed Harikrishna to score 7/9 and take first place on tiebreaks ahead of Laurent Fressinet and Gabriel Sargissian. Full results. What is it? The main tournament is a 7-round open with the top four after seven rounds playing a knockout on "Millionaire Monday" to determine the top placings. Other players continue with another two rounds of the open. What can you win? The tournament features a guaranteed $1 million prize fund, with $100,000 going to the winner of the top event, but lucrative prizes also available for much lower-rated players. Who's playing? The US Top 3 of Hikaru Nakamura, Fabiano Caruana and Wesley So are all taking part, though the clash with the World Rapid and Blitz Championships limited potential entries. Who won? A risky quick 7th-round draw between Nakamura and Luke McShane led to a huge 9-player tiebreak, including Fabiano Caruana and Gata Kamsky, to decide the final Millionaire Monday player. Hikaru Nakamura went on to win that and then found things much easier on the final day, when he beat Yu Yangyi and Le Quang Liem to win first prize. Check out our final report. What is it? A yearly speed chess event to determine the world's best rapid and blitz players. The Rapid Championship is a 15-round Swiss tournament over three days, while the Blitz Championship is a 21-round Swiss tournament over two days. What can you win? Each event has a $200,000 prize fund, with $40,000 for the winner. Who's playing? Despite a clash with Millionaire Chess depriving us of Hikaru Nakamura, Fabiano Caruana, Wesley so and Le Quang Liem most of the world's top players will take part. Who won? Magnus Carlsen retained his World Rapid title by finishing on 11.5/15, an unbeaten +8, one point clear of Ian Nepomniachtchi and Teimour Radjabov - final report. In the blitz Carlsen suffered a final day collapse, with Alexander Grischuk finishing half a point clear of Maxime Vachier-Lagrave and Vladimir Kramnik on 15.5/21 - final report. What is it? Two 7-round Swiss tournaments that brings together Europe's best club teams. In the Open tournament there are six players per team per match, while in the Women's event there are four. Who's playing? 25 of the world's Top 30 are playing, including Fabiano Caruana (SOCAR - 2014 winners), Hikaru Nakamura (Obiettivo Risarcimento - Italian Champions) and Vladimir Kramnik and Levon Aronian (Siberia - Russian Champions). Who won? 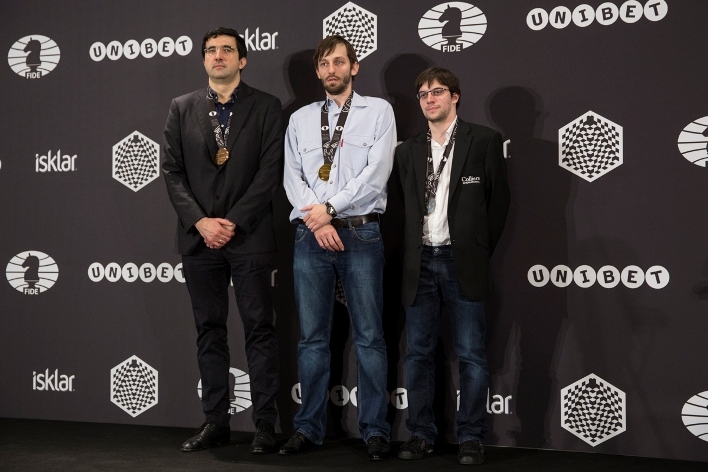 Six wins and a difficult draw in the final round gave Siberia the title, ahead of SOCAR and Mednyi Vsadnik (a St. Petersburg team led by Peter Svidler). The stand-out performance came from Vladimir Kramnik, who beat four top players in a row as he climbed back to world no. 4. Check out our final report. We aim to keep this tournament schedule updated as more information becomes available. If you know more about some of the events we'll be very grateful for your input in the comments section below, or you can also write to support@chess24.com.